A fraction of the electronics, charging in our current charging station – the kitchen counter. Ah, nothing says “Christmas” like weather in the upper 50’s, rain, and a flood of new electronics that need charging. I know, maybe some year we can try something traditional like snow and an Official Daisy Red Ryder Range Model 1938 Air Rifle BB Gun. Our current charging station is a box that replaces the faceplate of an outlet and gives 4 USB outlets and 8 plugs, and a place for one or maybe two iPods to sit (off the counter). But we are now a house with four phones, three iPods and three iPads. 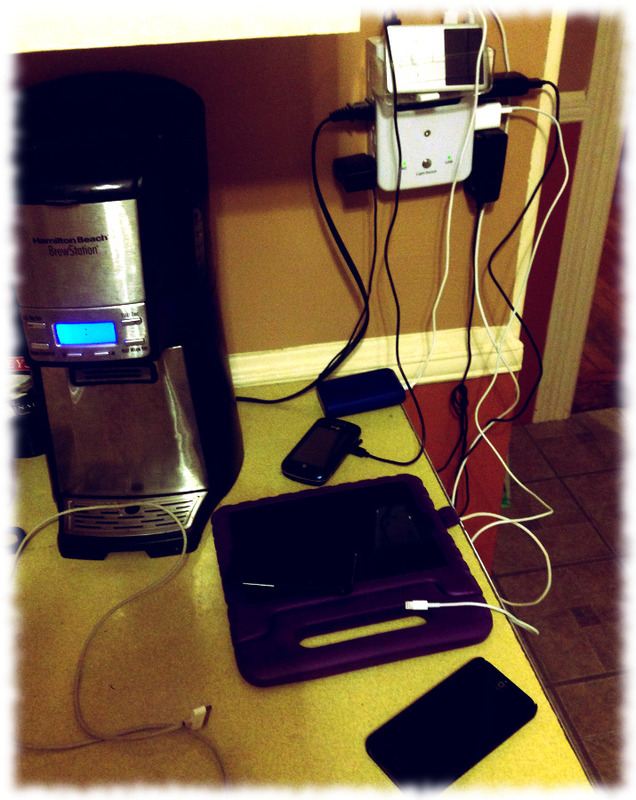 So, now the corner of the kitchen counter with the charging station is a muddle of charging wires and expensive electronic devices. A brand new iPad is just what you want sitting on the counter next to the coffee machine. We put an outlet high up on the wall in the laundry room so I could eventually build a charging station. I think that eventually meant “this week.” It will be nothing fancy, built from oak plywood and edged with oak. A fancy solid-wood charging station is on my long term list, but far enough down that it will probably never be built. But what fun is having a workshop if my “honey-build” list isn’t overflowing with projects that may never get finished (until all the things on the other never-ending “honey-you-really-need-to-build-it-before-I-give-up-on-it-and-buy-it” list are built). ← Drywall, Paint and Floor… The end is (almost) in sight.